Say hello to this brand new Sportage Si 2.0 petrol. The All-New Sportage brings a modern, progressive design approach to the medium SUV segment. Underneath the stunning styling, you’ll discover an all new platform and handling package that’s tuned in Australia, by Australian engineers. Say hello to all-new style – taut, strong body creases define the front and side surfaces of this vehicle. Its heightened beltline lends to a dynamic, always on-the-go stance, even when sitting still. This added sense of sophistication is sure to leave an impression on admirers and passers-by. Say hello to premium finishes – once inside the cabin of this Sportage, you’ll be greeted with the design, quality and style you’ve come to expect from Kia, featuring soft touch dashboard trim, purposeful storage spaces and a Touch Screen Infotainment system with Bluetooth connectivity incorporating a large 7.0” LCD screen as standard. 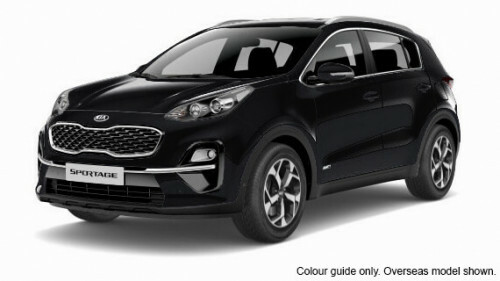 This Sportage includes a long list of premium features including + cruise control with steering wheel mounted controls + power windows (front & rear) + an MP3 compatible audio player + air conditioning + rear spoiler + roof rails. Say hello to safety – boasting a 5 Star ANCAP safety rating, this Sportage is one of the safest vehicles in its class and features an array of standard safety features including: + SRS Airbags Driver & front passenger, front side and curtain + ABS Anti-lock braking with EBD (Electronic Brake Distribution) & BA (Brake Assist) + ECS Electronic Stability Control with TCS (Traction Control System) + DBC Downhill Brake Control + HAC Hill-start Assistance Control + Rear view camera with dynamic parking guidelines. perfectly matched to its 6-speed automatic transmission it delivers 114kW of power and 192 Nm of torque. It is also covered by Kia Motors Australia’s comprehensive Customer care program and is backed by a 7 years/Unlimited Km Warranty along with 7 year Capped Price Servicing and 7 year Roadside Assistance. If you’d like to find out more, then please drop us a line today. Established in 1978, we’re a family owned business that has earned an impeccable professional reputation by providing friendly service and sound advice to our many happy customers. We go to great lengths to understand exactly what it is that you need, and we capture your desires with our unique sales and service checklist. With over 40 years of operation on the NSW Mid North Coast we know you will enjoy our hassle free way of doing business – we’ll make sure you Drive Away Happy! I'm interested in a Demo 2018 Kia Sportage Si Premium (stock #K604948). Here at Mike Blewitt, weâ€™re proud to be a household name in Coffs Harbour. We have a fantastic reputation within our local community not only because of our large range of New and Used Cars, but also because of our commitment to providing outstanding customer service. We have over 35 years of experience in buying and selling new and used cars in Coffs Harbour. Weâ€™re proud to offer the mid-north coast of New South Wales a number of quality new car brands including Ford, Mercedes, Isuzu UTE and Kia. Along with stocking a large range of the latest new car models, we also have over 100 quality used cars to choose from. Whether youâ€™re looking for a used ute, sedan or 4WD our team can help you. Because we know how much you love a good deal, we regularly offer Specials across our entire range. Here at Mike Blewitt, we donâ€™t just sell great cars. We also offer our Coffs Harbour community multiple Car Service centres for all vehicle repairs and maintenance. Our team can also help you organise a competitive Car Finance solution to suit your budget and lifestyle. For more information about our car dealership in Coffs Harbour, or to organise a test drive or service, please donâ€™t hesitate to Contact a friendly member of our team today.